Georgia State won a school-record fifth-straight road game with a 33-30 victory over Texas State on Saturday afternoon to become bowl eligible for the second time in program history. 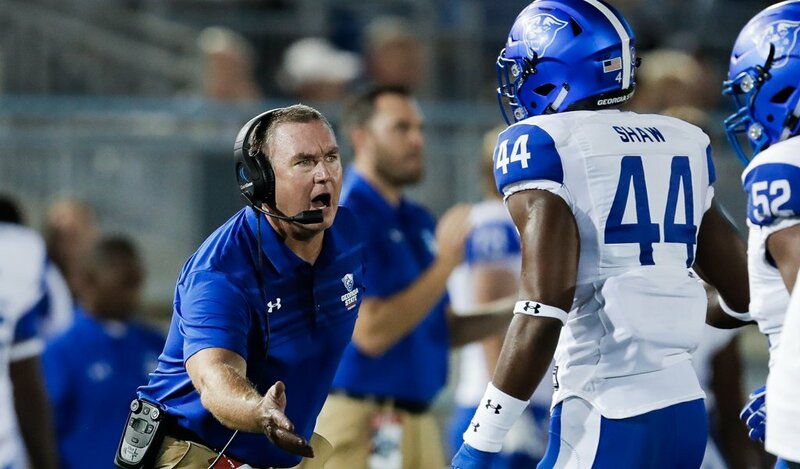 Georgia State improved to 6-3 and 5-1 in the Sun Belt and remain just a half-game out of first place in the conference standings. Kyler Neal’s touchdown run with 6:01 to play put the Panthers ahead for good. It marked the 12th career rushing touchdown which tied the school career mark. Brandon Wright kicked a school-record four field goals, including two 48-yarders. After Texas State drove for a touchdown on the game’s opening possession, the Panthers answered with Brandon Wright’s career-long 48-yard field goal. The big play on the drive was a 34-yard reception by Todd Boyd. On GSU’s next possession, Manning hit Devin Gentry for a short gain, and Gentry broke a tackle and raced for the end zone, completing a 34-yard scoring play that put the Panthers up 10-7 with six minutes to go in the first quarter. After a Texas State touchdown early in the second quarter, Georgia State got in position for another 48-yard field goal by Wright, this one bringing the Panthers within 14-13 with 7:39 left in the second quarter. Trailing 14-13, Georgia State opened the second half with another big play by Hart, who caught a pass over the middle and raced down to the 10-yard line for a 61-yard gain. But on the next play, freshman Tamir Jones had the ball knocked loose as he tried to reach the goal line, and Texas State recovered. The Bobcats converted the turnover into a field goal to lead 17-13 with nine minutes in the third quarter. Georgia State is off next Saturday before finishing the regular season with home games vs. Appalachian State (Nov. 25) and Idaho (Dec. 2) at Georgia State Stadium. The game time for the Appalachian State game will be announced Monday afternoon.